I love Vichyssoise (that is the very fancy name for the rather humble potato-leek soup), but I wanted to make a really healthy version, without potatoes and all the dairy. When Bri over at Design Love Fest asked me to create a comforting autumn dish that included potatoes, I jumped at the chance, but kind of cheated a little bit. Did you know that sweet potatoes are actually not in the potato family, and have a completely different, and far more powerful nutritional profile? When a food is that bright organe, it must be good for you! And oh, how it is. 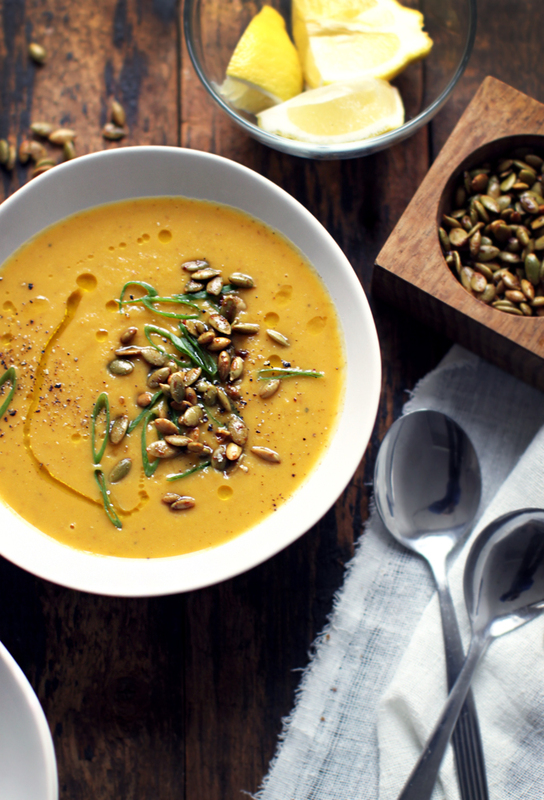 I think you’re going to love, love, love this Sweet Potato Vichyssoise with Ginger-Kissed Pumpkin Seed. It’s the new fall classic that will never go out of style. Head on over to Design Love Fest to check out the recipe! Great recipe !! Really good which you shared here!!! Simple recipe with great recipe!! This looks delightful. I cannot wait to try it. Where did you get that bamboo bowl? Love your blog! thanks for the recipes and education! amazing soup!!! I didnt have any garlic at home so i used some smoked paprika powder and it worked great! I also had some cooked butter beans over and i followed your recipe to make butter (added some muchrooms) and its fabulous!!! Thank you so much for inspiration!!! Mmm, yummy. I eat sweet potatoes several times a week. Thanks for a new recipe to try them in! Awesome cooking tips thanks for the information. Sarah… I love you and your lovely blog. And I hate to say this… but I made this soup and I really did not care for it at all. Everything else I’ve made from your recipes have been fab… but I didn’t care for this one. I adore this soup. It has just the right amount of warmth from the cayenne. Every bowl is a revelation! Thank you Sarah! Sarah – This was a gorgeous soup to make and to eat. I love the unique flavor profile that comes from the leek, sweet potato, and turmeric combo. Your recipes are incredibly enlightening and inspiring. That’s what food should be all about. If more people realized this and more importantly, embraced this, we wouldn’t be facing the health issues we are today. Have a helpful blog to read for us and sharing useful tips for students who loves to read online. Assignment Online. And keep continue to sharing helpful information for us. Made it today! Totally in love with the ginger kissed pumpkin seeds. I was used to take sunflower seeds on top of my soups but this is a nice change. Thank you! Yum! Do you have suggestions for making good homemade vegetable broth? Thank you so much! This looks delicious! Love the idea of ginger kissed pumpkin seeds! Wonder what we’ll be eating tonight at De culinaire werkplaats. I just made a similar version of sweet potato-leek soup earlier this week and thought, “this is SO GOOD, it must have been tried before!” And here it is! We must be on the same wavelength. I used Japanese sweet potatoes, which made the soup look more like traditional Vichyssoise, but this looks equally amazing. And you’re right–you don’t miss the cream or regular potatoes one bit. Thanks for always sharing beautiful, healthy, and insanely delicious recipes! So glad you’re all enjoying the soup! Me toooooooo! Penny – you can find shelled pumpkin seeds at any health food store. Sometimes they are called “pepitas”. They should be rather small and green. I saw it yesterday and just HAD to make it. I have just got to share your blog with my good friend Suzie Anderson of ‘french & Country’ she is going to adore your recipes and blog! I do and I’m not a vegetarian I just love good food! I made this last night! amazing!! Also, I am obsessed with the ginger-kissed pumpkin seeds! i made a second batch because I ate most of them before the soup was done! they will be a great snack for my nieces (and me!) this holiday season!..thanks!! This looks delicious. I would love to know where you find shelled pumpkins seeds. I bought ones with shells on and and I couldn’t remove the shells ….Thanks! I’ve just posted our last weekend’s YUM EXPERIENCE of winter desserts cooking class. We just loved to have you here. Check it out…Hope you like it! Oooh looks so good! Warm and cozy for the colder weather. I was just wondering what to do with the cup of cooked white beans I have sitting in my fridge. Perfect timing! Think I’ve found another comfort food to dig in this cold season. Got my eye on your next posts. Yum! I am adding this to my soups to attempt list! This looks super delish. Must check it out! Looks beautiful… I’ll check it out! Gorgeous! Colors, light, textures, everything. Must make this. jeez Louise… you’re my hero! This looks amazing! This. Is. Stunning. And I can see you in the spoons! whatup! I had no idea sweet potatoes and potatoes were so different! Thanks for that, as I love sweet potatoes and now I feel less guilty about eating them! 🙂 Love your twist to a French classic, definitely a must-try for the cold season.